Relax outside day or night on this bar set! 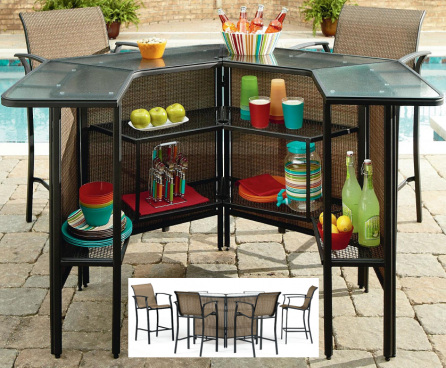 Get the 5 Piece Patio Bar Set for Just $299! (Reg. $600!) Opt for FREE store pickup! Step up your entertaining game this season with the Harrison 5-Piece Outdoor Bar Set in Tan. The U-shaped table includes multiple hidden shelves to hold plates or ingredients for mixing drinks all night long and has enough counter space to serve appetizers or dinner for up to 4 of your friends.